I love coconut but don’t often use it. 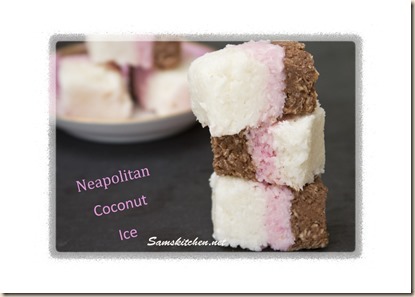 It’s been years since I made coconut ice and I thought I’d try and make an easy, quick and delicious recipe which means I won’t leave it years until I make another batch! What spurred me on to make this now was this months Foodie Penpal (details can be found here http://thisisrocksalt.com/foodie-penpals/?contact-form-id=4017&contact-form-sent=7020&_wpnonce=ee5ab37b4c) a lovely lady named Kelly, said that she really loves coconut, so I made some to include in her parcel. The 3 colour look is just something I wanted to try and thought would look pretty. You could leave it plain or go colour nuts or theme the colours for party favours! You could even add a little flavoured essence (like strawberry or raspberry) to the pink layer). I used a parchment lined small lunch container. 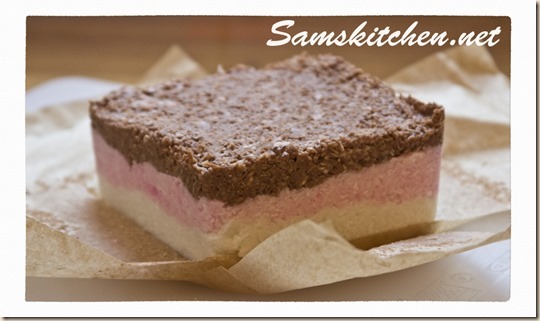 The size of the box was 12 cm square so anything about that size or a little larger is good. Place the desiccated coconut and icing sugar in a large mixing bowl and stir. Add the condensed milk and coconut cream (tinned coconut cream is found in most supermarkets or some specialists shops in the UK not sure how widely available it is worldwide but if you can’t get hold of it just replace with equal weight of condensed milk) stir well together to combine. Weigh the whole lot then split into 3, place each in a bowl. Add a little pink food gel to one bowl, the one I use is Wilton Rose (add a lot if you want a very pink colour!) mix well so it is a nice even colour. To one other bowl add the melted plain chocolate and stir well. Leave the other plain white. 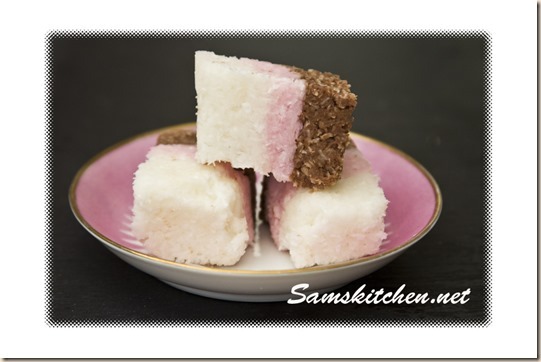 Place one of the bowl’s contents of coconut ice into the lined container (the colour choice is up to you) and press down until it’s even and compacted. I found placing a piece of parchment on top and pressing down with a small flat bottomed glass helped. Repeat with another colour and then again with the last colour.